As you learned in another tutorial, you can preview Word documents sent as attachments right from Outlook 2007; this convenient trick lets you quickly view the content of a file without actually opening it in Word 2007, or saving it on your hard drive before viewing its content. But since you most probably work with all your Microsoft Office documents stored inside the "Documents" / "My Documents" folder, and subfolders you created inside it, you will often prefer to save that attached document into a folder on your computer. And as you'll learn in this tutorial, Outlook 2007 offers several methods for doing that. 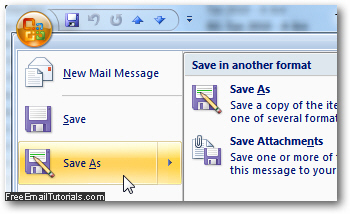 First, select the email message that contains the Word file attached to it; then, from Outlook 2007's main window, click on the File menu, and you'll see an "Attachments" submenu: click on it, and choose "Save All Attachments", or click on the name of the Word attachment in particular you want to save on your computer. Then, navigate to the folder where you want to save a copy of that document, and optionally pick a new name for the file in question. This will also bring up the same "Save As" dialog from which Outlook 2007 lets you choose where to save the file, and how to call it (or keep the current file name). And that's all you need to do to save an Word attachment! Note that all three methods achieve the same effect; likewise, all three will leave your Word 2007 attachment intact, and attached to its original email. By "Saving As", Windows is creating a duplicate copy of the file elsewhere on your computer. If you made any changes to the downloaded Word document file will be reflected in the copy saved on your computer, and not in the original file, currently still attached to the email inside Outlook 2007.